Six years ago today we left PA to begin a once-in-a-lifetime roadtrip. Some Saturdays, I post a segment of the stories from the six months we spent on the road in 03 and 04. I want to be back there! 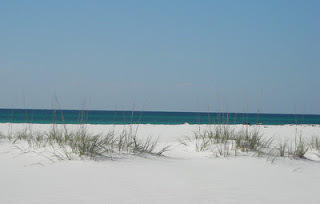 Back on Gulf Islands National Seashore – a barrier island off the coast of the Florida panhandle. The week we spent there lives in my memory as perfection. Driving down the single road on the island that took us to the campground, we were surrounded by nothing but white sand and water on both sides. This area of the island is narrow, so the waves of the Gulf of Mexico were visible on the south side and the calmer waters of the Pensacola Bay on the north side. The shimmer from the rolling sand dunes made us feel as if we have entered Narnia. We later found out the reason the sand glistens and sparkles is that the primary ingredient in it is quartz. After helping the boys with schoolwork for a few hours each morning, we spent the rest of our time on the beach, building sandcastles, biking on the trails around the fort or relaxing in the hammock. We explored the old fort one afternoon and learned that during the Civil War, the famous Indian warrior, Geronimo was a prisoner at the fort. Many days, I went for a run right before sunset on the gulf side of the island. Running on the beach is pure joy for me – the sounds, the feel of the sand, the water. I think it is one of the best things this earth has to offer. And running at that time of day was a bonus! For the previous ten years I had to run at 5 or 6AM before the busy schedule of the day started. But now that life was perfect, I had the luxury of going at sunset, which I loved. I started my run back in the direction of the campground. I heard music drifting towards me and I slowed to enjoy it. An elderly gentleman was playing a banjo as his devoted wife sat nearby. He was thrilled to have an audience to appreciate his music as I made myself comfortable on the shimmering sand. After entertaining me with various selections, he stopped to chat. They proudly told stories of their children and were sad that they don’t get to see them more. They wondered if families today aren’t as close as they should be. “Tell us about yourself,” one of them said. They were curious about our adventure. Both vigorously affirmed our decision to spend these months on the road with the boys. As I made my way back to our campsite, I thought about the advantage of sharing our stories with each other. We both benefited from our time spent together. Some of their concern for the next generation was lifted by the fact that my family was devoted to each other. I was reminded that a run on the beach is only one of the best things in life – family is even better. Hi there Janet, thanks for you sweet words on my post the other day. Just read your story of today…wauw what joy you spread out by your words, your way of living and enjoying moments like running. I do feel the same about seeing and living the moment. And you made me laugh big out loud about not holding a tune when you sang to God…I do the same and I can't hold a note eighter….love it. good memories and i like hearing about them. i also like the look of that white sand. Our stories go on, don't they?